Join Ray Tanzten, Ace Baker, and Big Sam’s Funky Nation on October 20 at 2pm CST as we show off, celebrate, and explore the brand new Studiolive 32, our incredible flagship digital mixer that we’ve been working on for quite some time, now. We’ll discuss the all-new effects processing and redesigned Fat Channel, FlexMixes, AVB, and onboard multitrack recording—with NO COMPUTER REQUIRED! We’ll have Q&A at the end, of course, and we’ll be giving away some stuff, including Studio One 3 Professional and a Eris 44 monitors. All told, you’ll have four chances to win! Signing up for this event below ensures you’ll get an e-mail reminder on the day of the show. 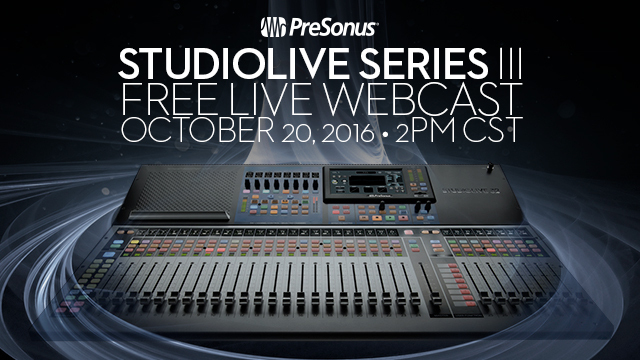 You can tune in at http://www.presonus.com/videos/presonuslive on the 20th.